To register and practice in the UK as an optometrist, the General Optical Council (GOC) requires students on approved programmes to demonstrate proficiency in core competences and have achieved a specified number of ‘safe patient experiences’ (episodes). To achieve this at the Centre for Eyecare Excellence (CEE), situated on the University campus, students are observed attempting various competences throughout the academic year. Progress, along with tutor feedback and student reflection, is recorded in standardised logbooks. There are 39 core competences split across six clinical areas, with an attempt within a clinic being assigned to a Clinical Episode. Episodes involve real patients and are meant to be as close to an actual clinic as possible, in terms of process, practice and professionalism. In this case study, Stephanie talks through the benefits of using PebblePad, including lessons learned along the way and her plans for developing the practice further. Why are you using PebblePad? We were certain that we wanted to move to digital competency and episode tracking and had been considering the pros and cons of several online systems for this. Most platforms we reviewed were provided by external companies and therefore came at a cost. Keen to explore whether the University had any systems in place that we could potentially adapt to meet our needs, I visited the ASTI webpages and came across PebblePad and the examples of how it was being used in other programmes. Curiosity over whether this could work for us led to contacting ASTI, and an initial meeting about our requirements for logging and tracking core competency and patient episode experience, within our third-year clinics at CEE. How did you approach the change process? After explaining our processes and requirements, and reviewing our complex paper logbooks, we were able to outline the way in which PebblePad could help. Over a period of five months we went from the idea of moving away from our laborious paper system being just a dream, to it becoming a reality. ASTI were hands-on and involved throughout both the design and implementation stages, providing support and valuable advice about how we could simplify and streamline our processes. They have been patient with our modifications and refinements and have listened carefully to the requirements of our regulatory body, the General Optical Council, to which we must adhere. They worked closely with our clinic management team to enable them to make the most of reporting features and allow easy monitoring of student progress. They also provided training on the new system to our clinical tutors and staff in the lead up to the new academic year and have created video resources to help us to introduce the system to our students in induction week. It is our students who have gained the most benefit from the new system, with access to feedback from clinical sessions within 24 hours of a clinic taking place. They can access their feedback from any location, simply by logging in to Pebble+. This means our students can now take much more control of their learning, through reviewing and reflecting on their feedback and achievements, and they can easily track their progress against their target number of patient episodes and GOC core competencies using in-built tracking pages. Our previous system required logbooks to be stored in the clinic, so the ability to review and reflect was limited, impacting on student experience. The second biggest benefit has been to our clinical management team. ASTI has supported us greatly in terms of getting the most out of the reporting features of PebblePad, and this has revolutionised the tracking of student progress and simplified the auditing process. As a result, the clinic management team has been afforded more time to focus on patient care, and the future direction of the clinic, which is fantastic. One further benefit that we perhaps didn’t foresee is that PebblePad workbooks allow us to target the training and development of our clinical tutors, in particular with regard to the level of consistency. The workbooks allow us to generate reports on rubric selections and written feedback, which can be filtered by tutor, and this is proving a really useful feature not only for training, but also for identifying areas where our rubrics could perhaps be made clearer, or where marks may need to be moderated by module leads to ensure assessment is fair. 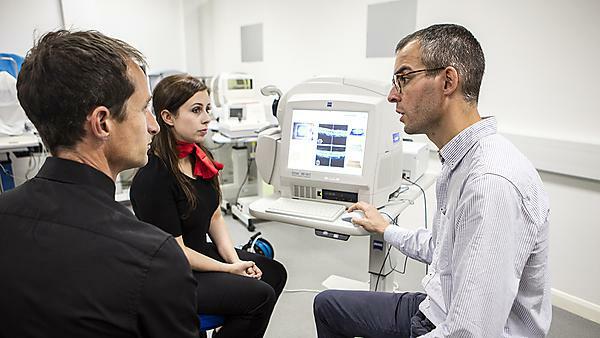 ASTI supported the Optometry team in deciding what technology was appropriate for their needs. iPads were chosen due to their ease of use, long battery life and compact size. In addition, they turned out to be one of the most cost-effective options. In order to give the opportunity for faster typing plug-in keyboards were also provided to make entering extended feedback quicker. In future iterations these might be used to record audio feedback and photograph evidence. What aspects didn’t work so well? PebblePad has been a brilliant tool for us, but we have pushed it to its limits and challenged its capabilities to a certain extent. There are some features of the platform that can make it challenging to use, particularly in a live clinical setting. For example, there is no automatic saving of any information inputted and there is no capacity for ‘pop ups’ within a page or ‘pre-filling’ of information once it has been inserted somewhere else. This can lead to a degree of repetition and a lot of scrolling down the page when it is in live use on an iPad. However, whilst a little frustrating, these things have encouraged us to think outside the box, modify our strategies, and accommodate this where possible. With this in mind, I think the biggest lesson learnt is that simple is best. We did manage to simplify our processes, even if it means that there is more work to do. We also hope that some of the future developments planned by PebblePad could help with refining some of the issues we have encountered. It is really helpful that ASTI are in regular communication with the PebblePad team, so they are able to put our ideas forward to them. What aspects would you improve? Although the rollout of our new workbooks has essentially gone smoothly, and been a big success for our students, there are still some refinements needed to get it to its most user-friendly format for our clinical tutors. This is something we will start to work on with ASTI, ahead of next semester. We are also actively seeking feedback and ideas from both our students and our tutors about how the workbooks could be adapted to meet any additional needs. What feedback have you had from Students? Feedback from our students has been very positive, they have commented positively on the ease of the tracking system and the accessibility of the feedback from their tutors. *An evaluation survey was created to capture student perceptions on using PebblePad. Finally, do you have any advice for others using PebblePad? My advice for others using PebblePad would be to get to grips with its limitations early on and then build from there. Moving from a paper to a digital system is also a good opportunity to question your systems and procedures and think if there are better, or simpler, ways of doing things.